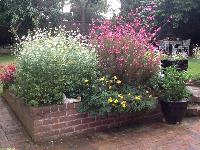 Have only had this beautiful Gaura for a couple of years and this year gave me a wonderful show, it looks so lovely next to the Salvia ( hot lips ) !! which was grown from a piece of the plant sticking over a fence from our walk around our suburb. I have now planted it in several spots in the garden. Just love this time of the year. Have to laugh - I can just imagine you having to jump over the plant blocking your way on the footpath! I love the colours together it looks wonderful. Comment on "Gaura & Salvia"